Put your thoughts on paper with our refillable gel pen. Each pen has pictures of your favorite dog b.. These refillable gel pens make a great gift for pet lovers. Each pen has pictures of your favorite .. 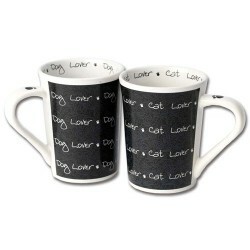 These coffee mugs are perfect for any coffee drinking dog lovers. They have sand-etched glass sayin.. This set of four double old fashioned glasses are sand etched with the wise tip to "Keep Calm and Hu..
Show some love for your pet! This is a 28oz. stoneware mug that looks great and functio.. These beautiful wine glasses will be the talk of the gathering with canine words of wisdom sand etch..
Fun gift for your pet lover friends and family. These gorgeous tankard mugs with sand-etched paw pr..